It’s a good idea to never get in a bubble-blowing contest with a galaxy. Galaxies are able to blow gigantic bubbles far out beyond their visible extent. In fact, our own Milky Way is blowing bubbles 25,000 light years above and below the its plane. These bubbles, however, aren’t made of Double Bubble, but rather gamma ray emission. First discovered in 2010, they were named ‘Fermi bubbles’ after the Fermi Gamma-ray telescope that was key to their discovery. Recently, a Russian team has found evidence that our nearest large neighbour, M31 or the Andromeda Galaxy, is also in the bubble-blowing league of galaxies. They were created by a supermassive black hole. As mass builds up around a black hole, forming an accretion disk, it heats up and can emit huge amounts of radiation at wavelengths from radio waves to gamma rays. Simulations show that sometimes black holes can accumulate mass too quickly which causes some of it to be violently expelled out of the galaxy. It could be that the giant Fermi bubbles seen in our galaxy are the result of activity from the galaxy’s central massive black hole millions of years ago when it was more active. They were created by the death of stars. When a massive star dies by supernova, it ejects its remaining mass into the interstellar medium with high winds. 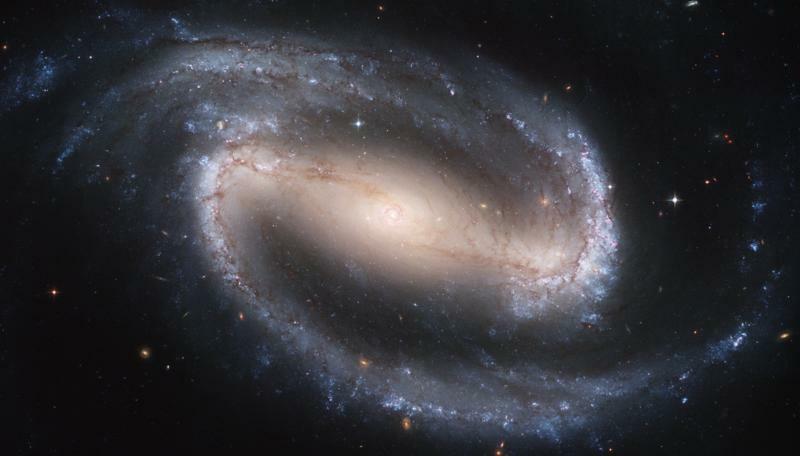 If enough supernovae explode nearby one another, their winds can combine to drive material straight out of the galaxy. 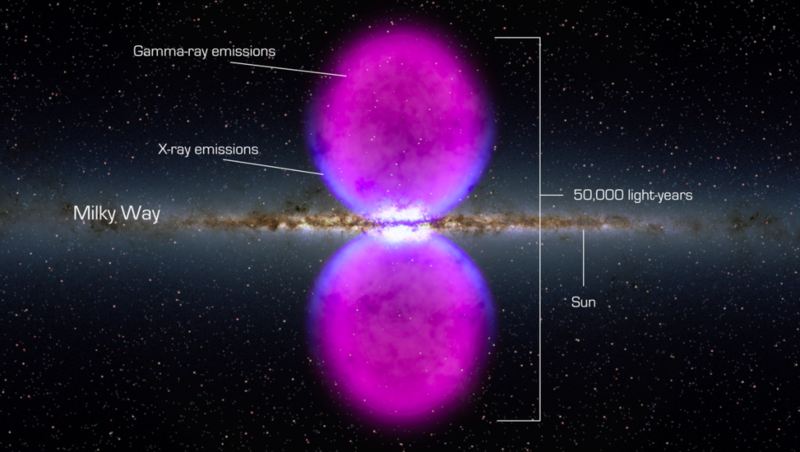 The Milky Way’s Fermi bubbles could be due to an era of heavy star formation long ago. Using the Fermi Large Area Telescope (LAT) a team of Russian scientists compiled nearly seven years of data to look for faint gamma ray emission that would indicate the presence of Fermi bubbles around M31. Searching the data from August 2008 to July 2015 they looked for gamma ray emission above 300MeV. They combined all the events they found in those years and fit models of the galaxy, the galaxy halo and the bubbles to disentangle what emission was from the bubbles and what was caused by the galaxy (see Figure 2). Figure 2. 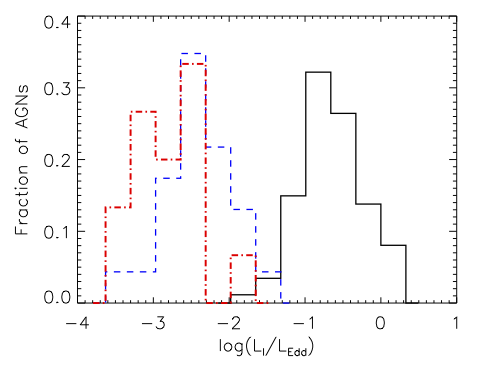 The model bubbles (1 & 2) used to match the gamma ray emission around M31. The bubbles are perpendicular to the galactic plane. The scientists found their simple spherical bubble models accurately described their data (see Figure 3) indicating the Fermi bubbles of M31 are very similar to those of our own galaxy. 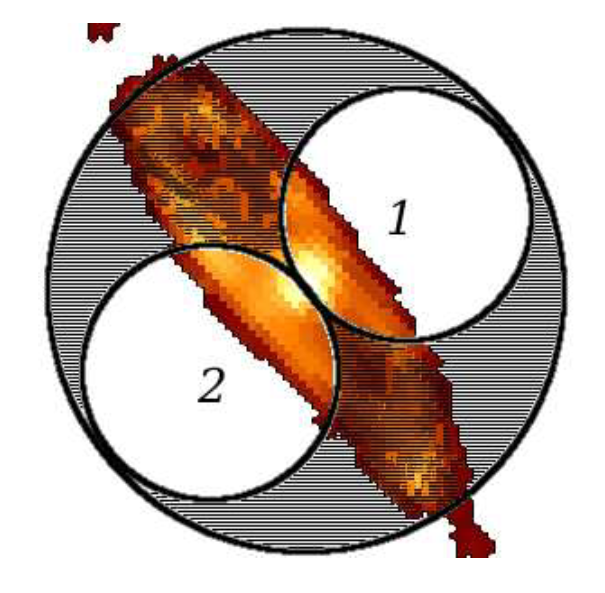 Through their modeling, they find the bubbles are best described by circular, rather than elliptical bubbles. 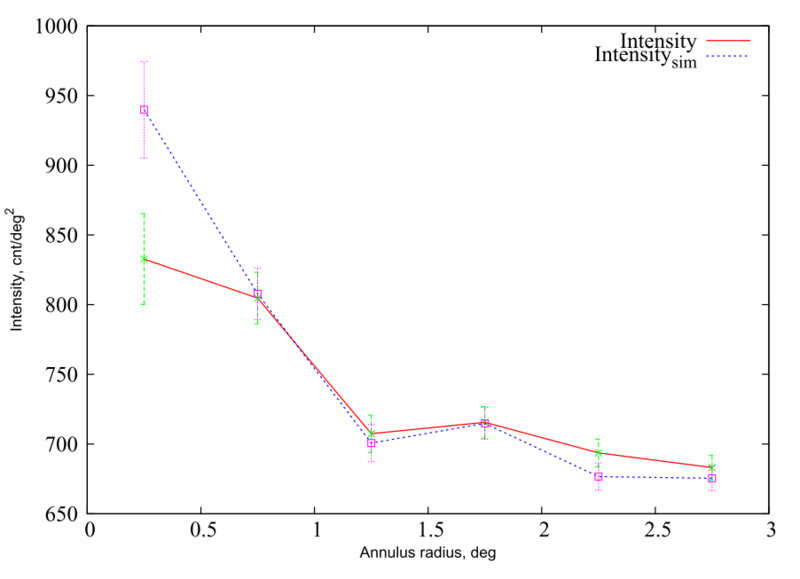 Because of this, the authors reject the possibility the gamma rays are created through the interactions of cosmic rays with an extended gas cloud, since this type of interaction would create a strongly elliptical shape. Instead, the bubbles are likely caused by past activity from the central supermassive black hole, a star formation burst at the center of the galaxy, or a combination of the two. The bubbles each extend 6.5kpc (~21,000 light years) from the center of M31 with a total luminosity of 3 x 1038 ergs/sec, which is 100,000 times more luminous than our sun, but spread over a much larger area. They are ten times brighter than the Milky Way’s bubbles, probably because the black hole at the center of M31 is much larger than our own. Figure 3. Looking at a cross section of the bubble, the model (blue and pink) matches the bubble’s intensity (red and green) quite closely. The model isn’t as accurate really close in and the authors suggest this is because disk is actually dimmer than expected. These findings hint that Fermi bubbles might be quite common in our universe. Since the bubbles are faint, we’re lucky to have one right outside our own galaxy to study in detail. Having bubbles associated with nearby galaxies like M31 may enable us to understand their origin and get a better understanding of the earlier days of these galaxies.